So excited that warm, glorious sunshine will be bracing us with its presence consistently soon (where I live, it has been on and off). This will be a busy summer for me and I definitely look forward to it! – Absolutely love this shade! I have been looking for a colour like this, so receiving this was perfect. It takes about 2-3 coats to get its true colour. I have not heard of this company before, but love this packaging. Very rockstar-like! The packaging states that it has a high gloss finish, but in my opinion it is not as glossy as it could be on its own. However, a glossy finish is not a problem with a nice top coat. – This is a very cutely packaged lip balm in a little tin. It is full sized, retailing for $7.50. I received the cotton candy flavoured one and yes, it definitely makes you think of the summer carnivals when you smell this! I looked up the company because I was curious and it is a Canadian company which is awesome (Canada, represent!). After trying this, smooth, soft lips are a result as intended. – This seems like an interesting product; once dispensed, the formula crackles and expands and then you style it into towel-dried hair. I do not usually style my hair, so this product will probably be of not much use to me. – This is also a full size product that retails for around $10 and the ingredients include green tea, aloe and vitamin e. I am glad that this contains natural ingredients and it smells wonderful! Just a tad big to fit in the purse, but a great, useful product in the dry winter months nonetheless. Overall, I am quite pleased with receiving 3 full sized products in this month’s box. I will definitely use the 3 products and the hairstyling product I may give a try, but it is not something I would normally use. I also like how I was introduced to a couple of companies that I have not heard of before (Teez and Barefoot Venus). That is the beauty of these subscription boxes; the exposure to new companies and products to try out. I may check out other products from Barefoot Venus as there is a coupon code to save %20 off an order. Sounds tempting! 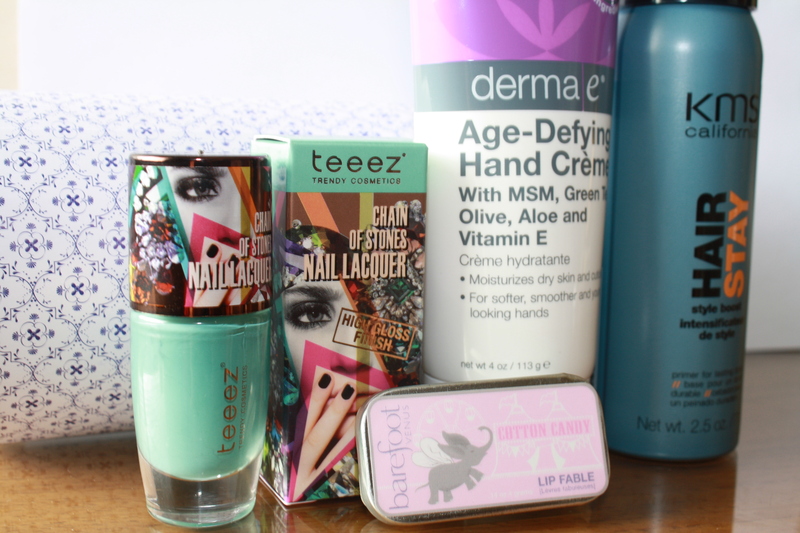 That nail polish looks awesome and like a great colour for summer :) I also got a lip fable, but in the Bazooka bubble gum scent.